The first eleven verses of this chapter (John 1:1-11) form the first of the seven signs in John. This is therefore a very good place to begin a discovery Bible study with not-yet believers. But for our purposes here, what can we learn about the way Jesus deals with the several issues that crop up? For a start, notice that Jesus was at the wedding feast. His mother was there too, and so were his disciples. We can see immediately that Jesus is ready to join in with the things that the people around him do. [Tweet it!] He is not aloof or legalistic, he has nothing against fun and people enjoying themselves. So it makes sense for us to act the same way. If you want people to feel comfortable in your presence do not be a party pooper. Just don't do that! Many people won't go near church because they think the people there will be old-fashioned, stuffy and steeped in tradition and religious rules. So host parties, invite people to a barbecue in your garden, get involved with social activities where you live. Not only was he there, he was willing to help out with the wine supply. So don't tell people they must not drink alcohol. Jesus drank wine. It is a bad idea to get drunk, and it's worse to become an alcoholic, so there are valid reasons for some people to avoid alcohol. But for most people most of the time, a glass of wine (or beer, or cider) is just fine - providing they are not about to drive a car or fly a plane. Here's the take home lesson, if Jesus is to be central in our lives, we need to be a part of the society we live in. [Tweet it!] How will we reach people or bless people or pray or encourage or make them think or love them if we set ourselves apart? We must avoid sin of course, but we must not be afraid to engage in society. Jesus ate with prostitutes and social outcasts like the tax collectors. And so should we. Today we're reading John 1:19-34. John the Baptist must have greatly troubled the religious authorities in Jerusalem. They sent a powerful delegation to question him, much as they would with Jesus over the next few years. Priests, Levites and Pharisees came together, the old authorities and the new combined. He told them very clearly that he was not the Messiah, nor Elijah (though Jesus later says he was) nor the Prophet (probably implying Moses). Note that Elijah and Moses were seen with Jesus during the transfiguration. And John told them plainly that his role was to prepare the way for the far greater one who was soon to come. And when Jesus did come, although John didn't recognise him directly, he said that "the one who sent me to baptise told me that the coming and remaining Spirit would be the one". The other things John tells us about Jesus is that he is Elohim's Lamb (a sacrifice offered not by mankind but by the Most High himself), that he will take away sin, that he will baptise with the Holy Spirit and that he is Elohim's chosen One. So we see here Jesus finally revealed. John has not only announced that the kingdom of heaven is here and called them to repent and baptised them with water, he has also identified the Messiah and announced his presence. And although the gospel writer doesn't mention this (but the other gospels writers do), the fact that Jesus was baptised by John shows how closely the Messiah identifies with the people. So closely that he shares in their sign of repentance and their act of baptism. Jesus is the promised One, he identifies with us and shares in our experiences, and he offers to baptise us in the Holy Spirit. That is all we really need to know about him. So already John has outlined the good news for us and has now introduced us to the nature of Jesus. So much in just 34 short verses! The scene is now set. If we are to follow Jesus and represent him in our broken world, we need to begin by understanding who he is. And John has told us quite plainly. So to the book of John, of all the gospels this one is my firm favourite. And John's opening remarks are amazing. I suggest you read through John 1:1-18 several times. "In the beginning" takes us right back to Genesis and the creation story. So the "Word", writes John, was there from the beginning, and this Word was with Elohim, and indeed he was Elohim and was with Elohim. Everything that exists was made through him, he is Life. The Life is what we call Light, the Light that shines in the dark and cannot be overwhelmed by darkness. John the Baptist came to witness about the Light. This Light was in the world but wasn't recognised by his own people. He appeared in human form and he is glorious - full of grace and truth. It doesn't come better than that! There's such richness in these words, such mystery and pregnant promise. They contain hope for those who believe and disappointment for those who do not. They speak of the unspeakable, portray the unportrayable. Here is someone who is wordlike, contains life, whose essence is light, who is not overwhelmed by darkness, who is full of visible glory, who is grace and truth. This One has come into the world in human form as a gift and to give us grace and truth and to be light, to reveal glory and show us the Father. How do we respond to this? What can we say or do that will make us worthy to approach him? Nothing! If our presence here is only through the blood of birthing following a human decision to have a child we have no hope beyond this life and this death. But if instead we believe and trust in the Word, he gives us the right to become the children of the Mighty One. And children inherit everything that belongs to their father. But although we can do nothing to make ourselves worthy, something is still required of us. We are to "receive him and believe in his name", writes John. Our response must be to receive him. We are to make him welcome, to honour him, to open the door to him. But what is his name that we should believe in it? John gives it in verse 17, Jesus Christ (in Hebrew Yahshua ha Mashiach) This means, literally "Yahweh saves, the Anointed One". 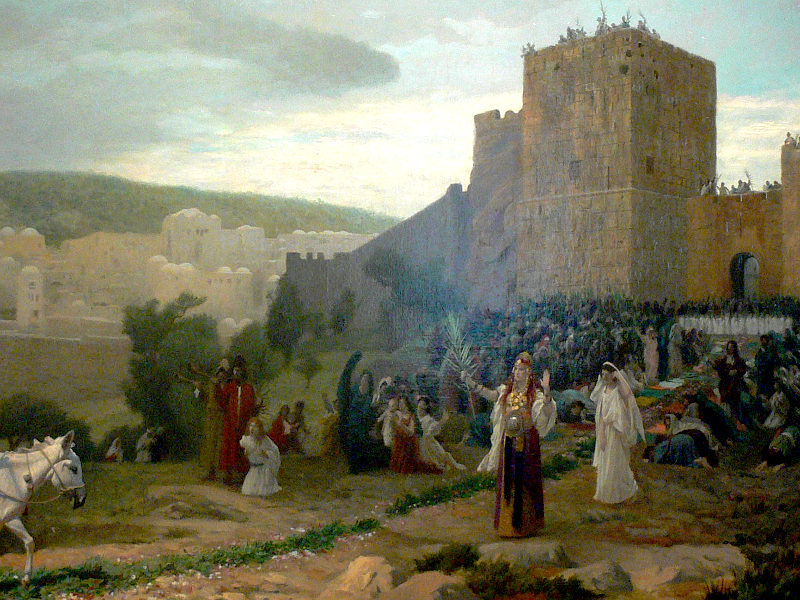 In Jewish history, the kings were anointed at the beginning of their reign. Jesus came and is the promised King. Was anyone else anointed in Jewish tradition? Yes - the high priest. So Jesus the Messiah (Jesus Christ) is King and High Priest. Not only will he love his people and rule over them justly, he will also offer up a sacrifice on their behalf. No wonder we are to see ourselves as a royal priesthood - as sons and daughters of the Father, and as brothers of the King of kings we are exactly that. John has already fully declared his gospel in the first eighteen verses. He has much more to tell us in the rest of his book, but if all we had was these eighteen verses, we would still have all we need. And where do we stand in the presence of One such as this? Where do we stand? We stand accepted, fully accepted just as we are. If we will accept him, he will accept us. And if we are accepted we will also be changed into his likeness. That was always our destiny. We were made in his image. We fell. If you accept him he will remake you in his likeness, just as he always intended you to be. The next post will start us on our journey through John, but first, here's some background about the book and its author. The book - John's purpose is to show that Jesus is the promised Messiah (Yahshua ha Maschiah) and that as the Son of Elohim he has all authority in heaven and on earth. To demonstrate these facts clearly he highlights some messianic signs performed by Jesus and calls on a number of witnesses. He's writing sometime in the thirty year period between the destruction of the Temple by the Romans in 70 AD, and his death in or around 100 AD. And his readers would have been Jews in the Graeco-Roman world as well as people of other nations who were interested in Judaism and the new teaching about Yahshua. John emphasises that Jesus came not just for the Jews but for the whole world. The author - Traditional research suggests there is little or no doubt that the writer of John's Gospel is the same John who was one of the twelve disciples. He is John the fisherman, brother of James, both of them sons of Zebedee. He probably also wrote the letters 1, 2 and 3 John as well as the Book of Revelation. Others (especially more recent scholars) consider John's gospel to have been compiled in a series of stages by several writers. John is sometimes referred to as "the disciple Jesus loved" and with Peter and James he was one of the three closest friends of Jesus. This gospel, then, may have been written by an eye-witness of the events described. If so, he really is someone we can rely on. He was there and he knew Jesus personally as well as anyone ever could. Not only that, some of his readers would also have been eye-witnesses so he couldn't have got away with wild exaggeration or flights of fancy. We've finished reading through Matthew, so next we're going to make a start in John. Hold on, there are four gospels - Matthew, Mark, Luke and John. So why are we not moving on to Mark? For one thing, I'm itching to get stuck into John. So are at least two of my readers. Matthew, Mark and Luke are known as the synoptic gospels because they give a similar view of events and share quite a bit of material. John is rather different. John focusses more on spiritual issues and he places some historical events in a different sequence. Deliberately so I think, something we might look at as we go along. So to spice things up and provide a bit of variety here's what I propose to do. Having completed Matthew we'll cover John 1-7 next, then we'll work through Mark, then John 8-14, then Luke, and finally John 15-21. How does that sound? I just wanted to let you all know to avoid confusion. Next time I plan to post an introduction to John. From now on I'll provide a bit of background for each gospel before we start working through the chapters. I didn't do that for Matthew so at some point we'll go back and put that right. But don't worry, everything will appear in the right place in the Index so you should be able to find everything quite easily. We can learn so much about Jesus from Matthew 28:1-20; this is a rich final chapter. The first thing to notice is that death cannot defeat him or hold him. But sometimes we think and talk about the resurrection without going beyond it. Jesus went beyond resurrection. Not only has he returned to life but he goes ahead of his followers. We should remember this. He is there in Galilee waiting when his disciples arrive. In the same way he prepares a path for us to follow and is always there waiting for us. And he has a mission for us. The disciples worshipped him (though some of them were doubtful). But hear what he said to them, for he says the same to us. "All authority in heaven and on earth has been given to me. Therefore go and make disciples of all nations, baptising them in the name of the Father and of the Son and of the Holy Spirit, and teaching them to obey everything I have commanded you. And surely I am with you always, to the very end of the age." Why are we to do these things? Because all authority has been given to Jesus. There is no limit to his authority, it is authority in heaven and on earth. In this section, Jesus is crucified, dies and is buried. Matthew 27:32-66 has a lot of very interesting detail and even a whole book wouldn't cover it exhaustively. It's good to look at those details and consider them all carefully, but we're not going to attempt it in this short post. Instead, look at the big picture. Jesus has been killed by the Roman troops and has been buried. To his followers this must have seemed like a tragic end to something that had been very special. Few of them would have had any hope beyond this point. There would have been a sense of finality, there was no way now that they would see his face or hear his voice again. What were they to do next? Of course, we know that the story is far from over. In a sense it's just beginning! Jesus had left them plenty of clues. He said he was going to prepare a place for them, he had told them to go to Galillee and that he'd meet them there. He'd told them that he'd be with them always, to the end of the age. And he had said that without him they would be able to do nothing. Sometimes we feel helpless and insufficient, unable to see a way forward. But in that we are in good company! Peter, James, John and eight other disciples also felt helpless and insufficient, unable to see a way forward. Just as they would be surprised by his presence among them later, so will we be. Are we ready for that? Do we really expect it? Or will we feel defeated and lost as they must have done? Like those disciples we must wait and see what will happen next! Many of us know how this feels, at least in terms of verbal rejection and mockery. Some, as in Syria for example, are being rejected and mocked in violent ways - even suffering loss of their homes and sometimes death. Whenever we stand for something we risk being knocked down for it by those who are jealous or angry or afraid. Sometimes it's enough merely to be regarded as "different". Matthew 27:1-31 shows that it was just the same for Yahshua. The Jewish religious leaders decided he should die. Under Roman rule the death sentence was denied them so they handed him to the Roman governor, Pontius Pilatus. The reasons they gave for a death penalty were flimsy, but the danger of a riot persuaded Pilate to ignore justice in order to maintain public order. Jesus was mocked and dressed in a red robe. Then he was led out and nailed to a Roman cross to hang and die. During this terrible time he was mocked and scorned again. Jesus came to be our friend, to show us the Father, to reconcile us. He says it was worth everything he suffered to bring us to him as his bride. We are unbelievably precious to him. He should also be unbelievably precious to us. Now events play out as Jesus had said they would. He is betrayed, arrested, brought before the Sanhedrin, and disowned by Peter (Matthew 26:36-75). It is very clear that Jesus is human just as we are. He is desperate for a way out; he prays for a way out; yet he knows the Father's will and intends to do what he must. As he puts it, the spirit is strong but the flesh is weak. He does not want to die, and especially he is desperate to avoid the dreadful pain and torment of crucifixion. Unlike us, he had no doubt seen criminals crucified by the Roman authorities, he knew exactly what lay ahead. He craves the presence of close friends in this time of angst, but they fail him. We are just like them. But as with them, he understands our weakness and doesn't hold it against us. We are weak not deliberately, but inherently. Tiredness overwhelms them because they are not capable of truly identifying with what is in his heart and mind. Perhaps they don't even understand that he really is going to die. When he is arrested it must have suddenly seemed more serious and urgent to them. But Peter still disowns Jesus. He is afraid, confused, anxious about his own safety. We are in all respects like Peter; what would it take for me to disown Jesus? How far would I tough it out? But Jesus loves us anyway, despite our many failures and weaknesses - just as he did Peter and the other disciples. Pray for strength in times of testing and weakness. And thank the Father and the Son that they stepped in and filled the gap on our behalf. And remember when you eat and drink together, the meaning of the broken bread and the wine poured out. We are getting close to the end of the gospel account; in Matthew 26:1-35 we read about the Seder, or Passover meal and some of the conversation that took place around the table. Notice how Jesus is embedded in the Jewish culture of his day, he celebrates the traditional feasts including this one, but he reuses some of the traditions for his own purposes. He says that the broken bread is his body and the wine is his blood. This would have been very memorable for the disciples. They'd have said to themselves every year, "Do you remember how Yahshua said this bread is my body and this wine is my blood?" After the meal they went out to the Mount of Olives, and he told them that they would abandon him later that night. We can learn from him even in this; we, too, should be embedded in our own culture. We might repurpose some of our traditions. Here in the UK we sometimes raise our glasses and say a few meaningful words when we share a drink on special occasions - weddings, retirement parties, at a house warming or at a special meal in a restaurant. Why not use times like that to give thanks to him for his involvement in everything we do? We enjoy a barbecue in the garden in warm summer weather from time to time, and often invite friends or neighbours. Could we use those occasions in some way too? Use your imagination. If necessary, create a tradition of your own. Why not? Another activity many people enjoy is to take a stroll together in the countryside. Perhaps we could use those times to think about some of the things Jesus said to his disciples as they walked together 2000 years ago. Matthew 25:31-46 makes the basis of judgement as plain as it can be. Are you a sheep, placed on Jesus' right? Or are you a goat, placed on his left? Do you face eternal life or eternal punishment? And in any case, what do these terms mean? We sometimes think of eternal life as a never ending time of joy and peace and happiness. We sometimes think of eternal punishment as constant pain and torment in a raging fire and separation from everything that is good. We think in terms of heaven and hell, but what do we imagine those to be like? The fact is we have some clues but we cannot know for sure and opinions differ widely. What we can say is that there is a significant difference between being on his right or on his left. There's no mention of faith in this passage, but there is a strong reference to the results of following Jesus and becoming more and more like him. Following comes from believing; nobody would follow a person they don't believe in. In that sense following or not following is evidence of believing or not believing. It's evidence of faith or lack of faith. Jesus always had a heart for the sick, the oppressed, the hungry, and the weak. So should we. In the end, those on the right did the things that he does, those on the left did not. Those on the right he welcomes, those on the left he rejects. Will Jesus judge you to be a sheep or a goat? Once more, Jesus shares two parables with his listeners. Remember that he's just been talking about the destruction of the Temple, the trouble that lies ahead, and that he will come unexpectedly. Now he presses home the message about needing to be ready and engaged in the work he has given us. Matthew 25:1-13 is a story about the young women who were not ready with spare oil when the bridegroom arrived. Matthew 25:14-30 covers the servants entrusted with funds while their master was away. In both cases we see the need to be dealing with things now, because the opportunity ends when the Son of Man finally appears. It's clear that for Jesus, this is a very important thing for us to know and do. This is, he says, what the kingdom of heaven will be like. What does the "kingdom of heaven" truly mean? It means the rule and authority that is from beyond this world that we know so well. And that rule and authority from beyond will arrive suddenly and unexpectedly. When it does, it will be too late to be obedient because time will have run out. So if we are going to obey the Master, let's do it now. Jesus says it's foolish to be unprepared (Matthew 25:3). And he gives out the tasks according to our ability (Matthew 25:15) so we have absolutely no excuse for failure. Here in Matthew 24:29-51 we see the Son of Man in all of his power. After the period of great trouble (immediately afterwards) all the lights will go out. The sky itself will be shaken, the sun, moon and stars will stop shining and the Son of Man will come "with power and great glory". Whether you see this as a literal convulsion of the entire universe, as a local manifestation in the Earth's atmosphere blocking the light, or as a figurative picture, it's abundantly clear that something of major significance is involved. Jesus says it will follow the sign of the times just as summer follows the time of young leaves on the fig tree in the spring. When spring is here, summer is inevitably just around the corner. This upheaval of Earth and sky is the same. But Jesus' words are confusing. He says, "This generation" without specifying which generation he means. The one he is speaking to? The one that witnesses the time of great trouble? And he says that not even the Son knows when the time will come, but only the Father. But until that time, life will go on as normal and people will be unsuspecting. But he does say very clearly that we should be ready. Jesus lived in the world for thirty years, doing nothing but building work and carpentry. Then, at the right time, he began the main task for which he had come. Like him, we lived in the world doing ordinary things until we were called for a new and extraordinary task. It's essential that we be found working when he comes, not sleeping. The take-home message is very clear even though the details seem mysterious. We have a new job to do and we need to be engaged in it wholeheartedly. Jesus becomes more specific in Matthew 24:1-28. The disciples are impressed by the massive and fine stonework but he speaks clearly to them about the coming destruction of the Temple. And he speaks about the problems and difficulties they will face before the time arrives. He says there will be persecution and even death, and that many will turn from the truth, and that love will grow cold because of the growth of wickedness. It's likely that Jesus is speaking here of the destruction of the Temple by the Roman General Titus in 70 AD and also perhaps about an end time that is still to come. Does he say things that resonate with you in terms of our own times? Jesus wants us to stand firm, he warns us about false prophets. He tells us that when he comes it will be clear enough (like lightning illuminating up the entire sky from east to west). Rumourmongers are like vultures, gathering round times of difficulty like vultures around a dead animal. Don't believe them! Through all of these hard times, where does our duty lie? We are called to love one another and to help the weak and the impoverished and the suffering. We are to be undeceived and not alarmed. We are to share the good news of the kingdom as widely as we can. The disciples were impressed by the massive and lavish Temple buildings, but it's not about technology or wealth - either then or in our own day. It's about truth and love and following the Son, bringing glory to the Father, and understanding the signs of the times. In this chapter (Matthew 23:1-39) Jesus deals with hypocrisy. In the first three verses he makes it very clear that the teachers of the Law and the Pharisees should be obeyed but not followed. They do not do what they teach which, of course, is hypocritical. We must be people who not only say right things, but also do them. We are not to show off, and we are not to take on titles such as Teacher or Father or Instructor. Can you think of other titles we should avoid? Jesus lists seven woes, seven key issues that will cause the religious leaders to come unstuck. He is generalising, there were some among the Pharisees who followed him, Nicodemus, for example. Read through these woes. They are strong stuff. If we are to keep Jesus central in our lives, it goes without saying that we should not do the bad things the teachers of the Law and the Pharisees did. But what about the good things they did? Was Jesus saying that we should meet all the requirements of Mosaic Law? I don't think so! He said that he came to fulfil the Law, not to destroy it. He also said that his burden is light. He calls us to go beyond the Law just as he did. Read Matthew 22:37-40 again. Love is the key, the Law is rooted and grounded in love. So love! And now the Sadducees approach him with a question of their own (Matthew 22:23-46). They seem to be much very interested in details of doctrine and teaching, and their specific question is about resurrection. The Pharisees believed the dead would return to life in the end times, the Sadducees did not. Their argument failed so the Pharisees again tested Jesus, sending an expert in the Law to question him. Not only did he answer well, Jesus then asked them about the Messiah and confounded them again. Matthew tells us that they were so dumbfounded that they stopped questioning him at that point. If we could meet Jesus in open conversation, what would our questions be? It's interesting to wonder. What would you choose to ask him? Or would you just sit and listen? It's very clear that Jesus is far less interested in theological points about resurrection or the Law than he is about love. When he says that loving the Mighty One and loving one another are the basis for all the Law, he is taking a new line. And we need to listen to him, hear what he is saying, and then do it. Love is the key. Love is the most important thing. That is a simple message, far simpler than arguments concerning the Law. Doctrine and theological argument often divide us. If instead we focussed on love, there would be no danger of division. This time we're looking at Matthew 22:1-22. The passage begins with another parable about the kingdom of heaven and finishes with the need to pay taxes to Caesar. Our lives are enmeshed in both spiritual and earthly kingdoms. It seems very likely that the religious leaders were still listening and would have heard the parable about the wedding banquet. What do you think they would have made of it? They would have understood that Yahshua was referring to them as the people who would not come to the King's banquet for his son. They probably realised that he was referring to himself as the son and that the King was Yahweh Elohim. They were determined to trap him and their plan was a shrewd one - get him to speak against the Roman taxes in the presence of Herod's supporters. Then matters would take their course and Jesus would be silenced, at best executed and at the very minimum shut away in prison. But of course he was too wise for them and they were stymied once again. As Jesus' followers we too should pay what the state requires of us while also paying due regard to what the Almighty requires of us. And one of those holy duties is inviting the people around us to the wedding feast of the Son. If we plan to be there ourselves, we'd better be robed in righteousness when we're in his presence. In the first part of the chapter, Jesus demonstrates his authority in a variety of ways. But his authority does not go unchallenged. In Matthew 21:23-27 we read about a direct challenge from the chief priests and the elders of the people. They demand to know what his authority consists of and also who gave it to him. They made these demands while he was teaching. In other words, right in front of the people who were listening to him. This was a very public confrontation. Instead of answering these two questions, Jesus asks a single question of his own. Not only that, he puts the onus on them to respond first. "If you answer my question, I'll answer your's." They equivocate, so Jesus says, "Neither will I tell you by what authority I am working". But he doesn't leave it there; he tells two parables one that describes their past failures and another that predicts his death and explains their thinking in their coming moves against him. In Matthew 21:28-32 he compares them to a disobedient son who says he will but doesn't. And he contrasts them with the tax collectors and prostitutes who are entering the kingdom ahead of them! And in Matthew 21:33-46 he compares them to wicked tenants who murder the heir of the estate. They knew that both parables were aimed fairly and squarely at them. And they wanted to arrest him. we will need to avoid throwing pearls to the pigs, but at other times we will need to be outspoken regardless of the opposition. We can see examples of both in the book of Acts, particularly in the life of Paul. Father, give us the wisdom to know when to remain quiet and when to speak out so that your will may be done and all the glory will be yours. Jesus enters Jerusalem and spends the night in nearby Bethany, returning to the city in the morning. He probably stays at the house of Lazarus, Mary and Martha. But his arrival in the city is different this time; there are huge crowds and a lot of noise and celebration. The city is excited. Matthew 21:1-22 describes the scene and some interesting events, the donkey and her foal, the cloaks and branches placed on the road by the crowd, the chanting and shouting, the upheaval in the temple courts, the healings, the conversation with the chief priests and teachers and the fig tree incident. Things are clearly coming to a head now. In the past Jesus has slipped away and avoided the limelight. This time he makes no effort to moderate it or calm things down. This is not "gentle Jesus, meek and mild". We follow a king, indeed he is the King of kings. His authority and power is all over this passage. He has the authority to use the donkey. Is he making use of what is not his? Or is he demonstrating that everything in the universe is his to command and employ? The crowd understands his kingly status, calling him the Son of David (the greatest king in Israel's history, the father of wise Solomon). He takes authority over the activities in the temple courts. It is not a place for trading and profiteering. As so often before, he takes authority over blindness and lameness; where Jesus is, all will see clearly and walk freely. He speaks authoritatively to the religious leaders too, wasting no time in lengthy conversation but walking away. He even demonstrates authority over a fruitless tree. It's no coincidence that the fig tree is symbolic of the nation of Israel. The nation has not borne the fruit that was expected of it and now it will wither. Forty years later the temple will be destroyed by the Roman army after a terrible siege of Jerusalem, and all Jews will be made to leave the city. It will be redeveloped as a Roman town and Jews will not be allowed to enter. Jesus tells his astonished disciples that believing prayer will bring about anything they ask, not only the tearing down of a nation but even the tearing down of a mountain. How should we respond to such an awesome king? He has authority over everything. Through him and in him, so do we. Our one goal, therefore, should be to keep Jesus at the centre of all we do and say and think and are. "Without me", he said, "You can do nothing".